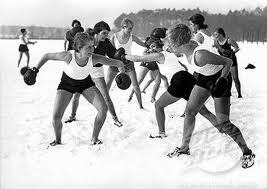 A Bit of Women’s Boxing History. Women fighters of this era beginning in 1876, included Nell Saunders who purportedly out fought Rose Harland in the first “official” female bout in the United States at Hill’s Theater in New York. Other important fighters included Hattie Stewart, the first female world boxing champion, and Britain’s Polly Fairclough from a family of well-known boxers and wrestlers. Polly was renowned for her prowess as both a boxer and a Greco-Roman wrestler, and holds the distinction of having been the first female to fight at London’s National Sporting Club (she fought against men), and purportedly put on an exhibition bout with Jack Johnson in Dublin. In the late 1940’s and 1950’s Britain’s Barbara Buttrick, a 4’11” fighter with a powerful jab known as “The Mighty Atom,” took up the sport having read about the exploits of Polly Burns. She found a trainer in London (whom she eventually married) and set out to have a career as a fighter mostly on vaudeville stages and other exhibition venues in England. 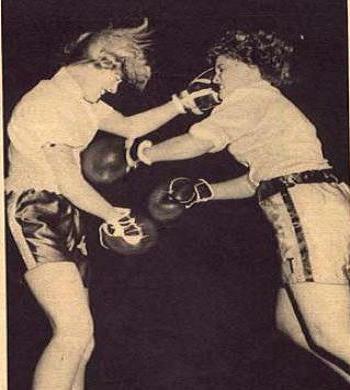 After arriving in the United States in the 1950’s, however, Buttrick was able to push the sport by finding other women boxers who were going along the same path – and fighting men, one step ahead of the boxing commissioners who continued to keep the female sport underground. 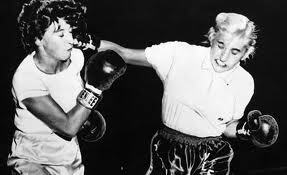 Still, she was able to draw large crowds and had the first televised female bout in 1954. There were also a smattering of big crowd draws, along with a growing number of professional fighters who plied the canvas in the 1960’s and 1970’s to include such boxers as Sue “Tiger Lily” Ryan a true trailblazer for the sport of women’s boxing and such fighters as Caroline Svendsen, the first woman fighter to be licensed by the Nevada State Athletic Commission in 1975 and Pat Pindela, the first woman fighter to be licensed in California in 1976.